Recently, I was contacted regarding an older blog entry discussing the DB2 security feature of surrogates. During an audit a strange entry was found in the catalog table SYSCAT.SURROGATEAUTHIDS. Whether I could take a look. So, let us take the security-themed tour through some DB2 catalog tables together. What is the strange entry? In a new database, created as regular or restrictive database, the following entry is found. What does it mean and what is SYSATSCONTEXT (highlighted below)? 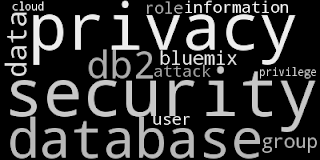 The DB2 Knowledge Center provides an overview of all security-related catalog views. As can be seen, SURROGATEAUTHIS "lists the authorization IDs for which another authorization ID can act as a surrogate". The table is not mentioned in the document of default privileges granted on creating a new database. So let's go to the roadmap to catalog views and from there to the entry for SURROGATEAUTHIDS. SURROGATEAUTHIDS is found in the category of "protected tables". The above entries show details for the trusted context. The "ATS" indicates it is part of the DB2 Administrative Task Scheduler. In a non-restrictive database, by default, any user could add a task to the scheduler. Those tasks are later executed as the specific user, i.e., using the authorization ID of that user. Hence, the trusted context is used. They allow to execute SQL statements on behalf of an user (see my old blog entry on "power of attorney and trusted contexts"). Conclusion: The strange catalog entry belongs to the infrastructure of the DB2 Administrative Task Scheduler and seems to be used run scheduled task on behalf of DB2 users. 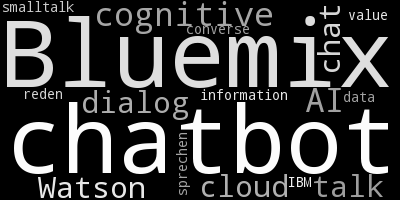 If you have been coding up your own chatbot using the IBM Watson Conversation service on IBM Bluemix, then you might be aware of the new features in Conversation API. Earlier this year I wrote a small tool to manage chatbot workspaces (read here the blog about the management tool). I updated the tool to the newest API version and added basic support for one of the new API functions. You can now invoke my "Watson Conversation Tool" with the "-logs" parameter. It retrieves recent interactions, i.e., processed messages with all the details. The logs are great to see what's going on (of course), to understand why a specific response was generated by Watson Conversation and hence to improve a chatbot. [henrik@mymachine] python wctool.py -logs -id "123123b8-123b-1234-a656-6dxx5a2xxf15"
"text": "@db2bm Was liegt heute an, wie wird das Wetter?" The API allows to filter, sort and paginate the output. If you want that added to my tool, let me know by leaving feedback or opening an issue. Recently, I was a coach at a hackathon in Germany. 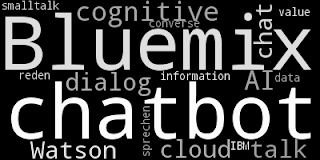 Students were tasked to build solutions for a given topic and the solution had to include a chatbot based on the IBM Watson Conversation service. It was impressive how broad the solutions were, what other services were integrated with a chatbot and how easy it was to build a solution using IBM Bluemix. The following “lessons learned” and tips are from my work as coach. They hopefully help you design your own great chatbot.